Global Non-Protein Nitrogen in Feed Market size was worth over USD 750 million in 2016 and will surpass 3 million tons by 2024. Strong application scope in animal fodder industry is anticipated to drive non-protein nitrogen in feed market. Growing awareness pertaining to livestock diseases along with the need for safe nourishment practices is anticipated to enhance product penetration. According to FAO, animal feed production was estimated to account for 11% share for calves & cattle, 23% for sheep and 6.6% for pigs in 2017. Increasing health consciousness coupled with the growing population has propelled meat consumption. According to the Organization for Economic Cooperation & Development, average meat consumption is 75 pounds per person annually, worldwide. Shifting consumer preferences towards the ready to eat processed meat will further facilitate product market growth. Upsurging demand for high-quality dairy products and meat has driven the demand for non-protein nitrogen in feed market. The major factors driving diary industry growth are cold chain development, increased cooperative & private investment and changing market mechanisms. In addition, improvement in milk processing technologies, farmer's training and strict food safety norms by the government are the key factors likely to propel industry growth. Increasing necessity for the high nutritional value dairy & meat products is projected to provide significant growth opportunities. Improved processing of major feed additives including emulsifiers, vitamins, and enzymes will provide lucrative opportunities for industry players. Additionally, growing consumer awareness related to the importance of animal protein intake will play a vital role in influencing demand. 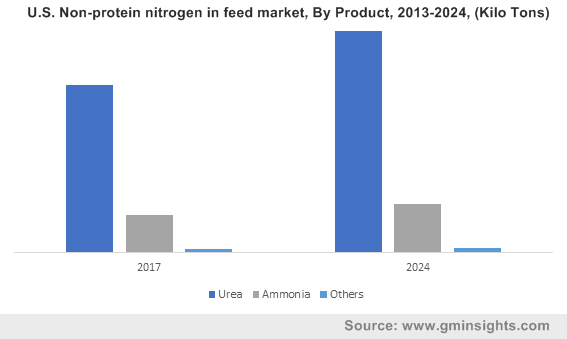 Growing demand from animal husbandry and increasing expenses to maintain proper animal health will drive non-protein nitrogen in feed market. Furthermore, rising awareness regarding the need for providing quality and effective pet food will augment product demand. Factors such as ease of availability, the rise in cattle population and cost efficiency will positively enhance non-protein nitrogen in feed market growth. The advent of the new manufacturing techniques will reduce the overall production cost thus influencing non-protein nitrogen in feed market price trend. Also, companies are focusing more on the production of specific proteins with specific characteristics. However, stringent government regulations regarding animal fodder and toxicity in ruminants may hamper industry growth. Urea was valued over USD 550 million in 2016. Increased intake of dry roughage, high nitrogen content of over 40% and reduced live weight loss are the major factors supporting the segment’s growth. In addition, increasing application of urea as a building block for non-protein production by the rumen microbes is expected to provide a positive outlook for the industry growth. Less expensive alternative source of protein has further added to the product’s demand. Ammonia accounted for more than 15% of the industry share. Product being a key source of nitrogen to carry out the microbial protein synthesis in the ruminant's stomach has provided a positive outlook for industry growth. However, the comparatively high ammonia price trend may restrain industry growth. Dry formulation is estimated to register over 2,500 kilotons by 2024. Excellent thermal stability during feed processing operations and better ease of handling are the factors supporting this segment’s growth. They are widely available in powdered and pellet grades across the world. High sulphur and protein content have resulted in increased demand for dry form products in supplementary feeding. Liquid formulation will witness gains over 3.5% up to 2024. Increased product availability at a competitive price & ease of storage compared to counterparts will provide significant business opportunity. Moreover, new processing technologies are anticipated to reduce the overall production cost over the projected timeframe. Ruminants generated over USD 550 million in 2016 owing to upsurge in demand for milk and its by-products coupled with increase in consumption of red meat will flourish the market. High protein deficiency in cows that are consuming low-quality fodder has propelled the product demand for this segment. The rise in meat consumption owing to increase in consumer affordability are the major factors propelling industry growth. Swine will observe gains over 3% up to 2024. Positive results amongst swine in terms of improved health & increased nutrients intake is another factor supporting product demand. Growing consumption of pork in several countries across the world including Japan, Poland, Canada and Russia will fuel the industry size. Poultry was valued over USD 85 million in 2016. The robust growth is due to growing meat & egg consumption with increase in middle-class income. Low product price & production costs and short production cycle are the major driving factors of poultry segment in developing countries. According to industry estimates, global poultry consumption is increasing significantly at a growth rate more than 4%. APAC non-protein nitrogen in feed market was valued over USD 350 million in 2016. Improved socioeconomic conditions mainly in Japan, India, and China has enhanced industry demand. Development of advanced technology for effective protein synthesis from non-protein sources in Asian countries has led to wide-scale product usage. Rise in the livestock population in last few years is a key reason for the surge in product demand. North America non-protein nitrogen in feed market will witness over 3.5% growth up to 2024. Increasing consumer focus towards higher protein diets along with greater affordability owing to growth in disposable incomes will drive the industry. Further, availability of dairy products through various channels has further increased product demand. Europe accounted for over 10% of the overall industry share in 2016. The requirement of improved fodder quality to produce superior quality meat will drive the product demand. Increased investment from numerous multinational manufacturers to meet with government regulations regarding product usage will boost regional demand. 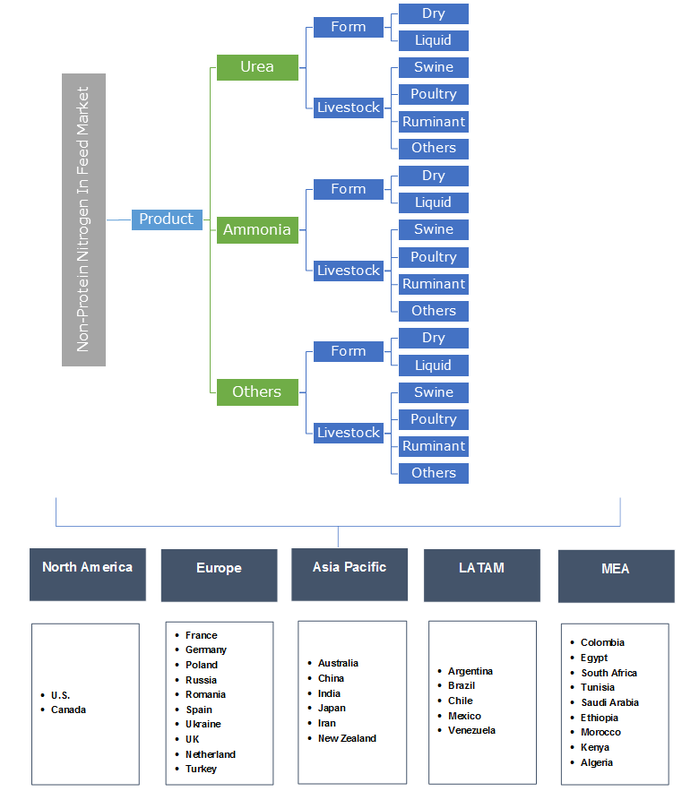 Global non-protein nitrogen in feed market share is fragmented with the presence of numerous local and international players in the industry. Archer Daniels Midland Company, Yara International ASA, Potash Corporation of Saskatchewan, Incitec Pivot and Borealis are some of the key industry players. Firms are mainly focusing on strengthening their position in the industry by implementing numerous growth strategies including, agreements, joint ventures, mergers & acquisitions, new product launch and production capacity expansion. Further, increased focus on product innovation and research & development activity will further help in attracting more consumers in the industry. Non- protein nitrogen in feed is an essential chemical element of the amino acids that are basic building blocks of the protein. The emergence of new protein sources will trigger industry growth, thereby providing new avenues for manufacturers. Expansion of supply chain dynamics coupled with advancement in technologies for the product manufacturing is anticipated to positively impact the industry demand.